I don’t think I have ever, in my 24 years, had Chicken Waldorf Salad before. Ever. Not in a restaurant, at a friend’s house, at a picnic, at a pot lock, and any other scenario you can think of. I’ve heard of it, I’ve seen it on menus, but I’ve never eaten it. I don’t know what overcame me to make it at home, but boy am I glad I did! I loved this dish. It was a nice break from all the “heavy” winter foods I’ve been eating and it was so simple to put together. I based it off a recipe I found on Eating Well. I think this will be my go-to recipe for using up leftover chicken from now on! 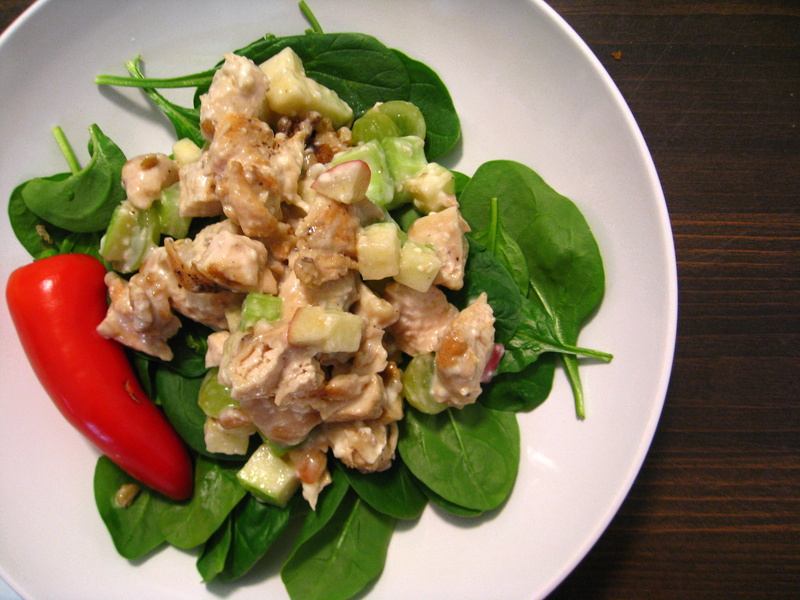 Combine chicken, apples, celery, grapes, and walnuts in a large bowl. In a small bowl, whisk together mayo, lime juice, honey, salt and pepper until smooth. Pour dressing over chicken and toss to combine. Serve immediately over a bed of baby spinach. Categories: Chicken, Dairy Free, Gluten Free, Main Entrees, Meat, Quick & Easy, Salad, Special Diets | Tags: chicken, main dish, quick and easy, salad | Permalink.